The Nigerian Shippers Council (NSC) has given an insight into why it introduced registration fee at the ports. The ports economic regulator said the registration of port service providers will help the government in policy formulation and rid the sector of quackery. The Director of Legal Services, NSC, Samuel Vongtau, said through the registration process, the Council would be able to know the number of service providers operating within the sector, adding that it will also help bring sanity to the port environment. NSC last week introduced registration fee for stakeholders and service providers operating at the nation's seaports. The registration fee, which is to be paid by clearing agents, shipping companies, Indigenous Shippers, Inland container operators, terminal operators, offdock terminal operators is to help the council weed out touts and quacks from the industry. A breakdown of the registration fee released by the Council showed that shipping line agencies are expected to pay a registration fee of N100, 000 per annum, cargo consolidators - N20,000; dry port operators - N50, 000; freight forwarders and clearing agents - N10, 000; hauliers - N10,000; Inland Container Depot operators - N50,000; off dock terminal operators - N20,000; Seaport terminal operators - N100, 000; shippers - N1,000; shippers association - N5,000; Stevedoring companies - N20,000, and warehouse operators - N20,000, with an annual registration of same fee. However, port service providers, including shipping lines, freight forwarders have kicked against the introduction of a new registration fee by the Nigerian Shippers' Council to enable them operate at the port, saying it would further increase the cost of doing business at the port. Vongtau, at a sensitisation workshop organised by NSC for ports service providers in Lagos, said: "Registration will bring sanity and reduce congestion at the port environment. Once the service providers are registered and known, the number of people entering the port will be reduced. "Congestion will be reduced drastically as only the registered service providers will be given access to the port environment. This will lead to increased efficiency in service delivery. "Knowing the players in the ports, in terms of numbers and types of businesses they are doing, financial projections will be made easy as experts would easily know what the sector can generate from the types and number of businesses," he said. He, therefore, urged the industry players to ensure that they register with the Council in order to help in providing efficiency at the nation's port. Responding to concerns raised by the service providers, Vongtau assured that the Council would consider a review of the registration fee, but maintained that defaulters would be denied access to the port. The service providers lamented the multiple charges they contend with from other government agencies, including the Nigerian Port Authority (NPA), the Nigerian Maritime Administration and Safety Agency (NIMASA), Customs and the Council for the Regulation of Freight Forwarders in Nigeria (CRFFN), among others. According to them, the implementation of the fee will erode the confidence they have in the Council as an interim port regulator seeking a reduction in cost of doing business at the port. A representative of one of the shipping companies, Ohizu Vincent, said the introduction of the charge would add to the cost of shipping line services which eventually would be borne by the importers even as he stressed that it will also discourage indigenous shippers. "This is cost addition to what the shipping lines are going to incur. What are the criteria set aside to corroborate this payment? You have asked some to pay different payments and you have given the bulk of the payment to shipping agencies. Looking at what Nigeria is today are we trying to encourage indigenous shippers or bring them down because with such charges, it will be difficult for indigenous shippers to make these payments and still renew this charge," he said. 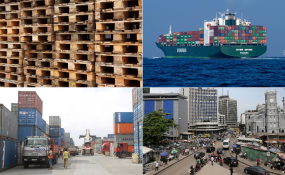 Vice Chairman, Freight Forwarders Trade Group, Lagos Chamber of Commerce and Industry (LCCI), Las Alli Shobande, urged the Council to focus more on its regulatory functions than revenue collection as there are so many charges already existing in the port. He said: "We are already burdened with too many regulations; there is NIMASA, NPA, NCS, CRFFN and the rest of you. Try and streamline these charges. You should look at the process where it should be more of a regulation than revenue collection." Immediate past president, Association of Registered Freight Forwarders in Nigeria (AREFFN), Frank Ukor, on his part called for a downward review of the fee saying, "We say we want to reduce the cost of doing business at the port but with all these payment you want us to make are we increasing it or reducing it? Please reduce the payment for practitioners as we are already feeling the pains of various charges at the port,"